PONTE VEDRA BEACH, Fla. – The Albertsons Boise Open presented by Kraft & Nabisco conducted annually at Hillcrest Country Club in Boise, Id. was awarded with the Web.com Tour’s Best Pro-Am Experience Award at the PGA TOUR’s Tournament Meetings on Thursday, December 7 in Boca Raton, Fla.
“This is a tremendous honor to receive the award for best Pro-Am Experience,” said Albertsons Boise Open Executive Director Jeff Sanders. “It’s always a special week with the pressure of the Web.com Tour Finals and we look forward each year to creating a premier Pro-Am experience to compliment that.” The 2018 Albertsons Boise Open will return to Hillcrest Country Club September 13-16. At the end of the day, Chesson Hadley had a smile on his face. But it took awhile for that smile to come to fruition. 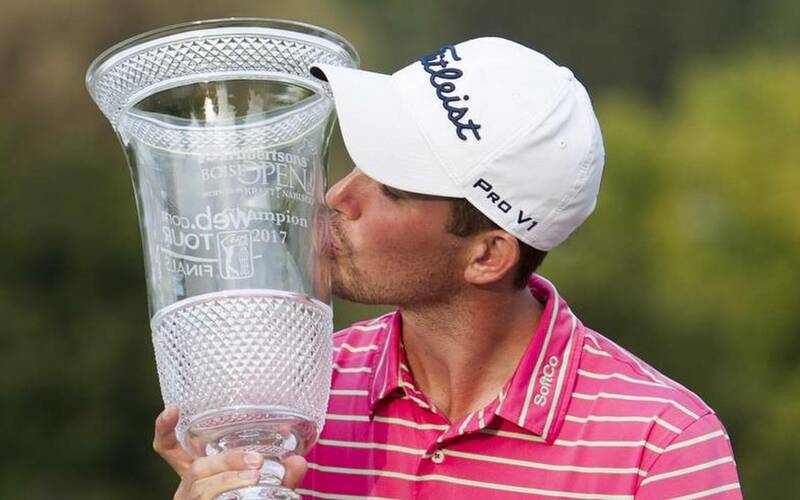 Hadley began the fourth round of the Boise Open five strokes off the lead, but the Raleigh, N.C., golfer birdied three of the final four holes to rally down the stretch and win the golf tournament Sunday at Hillcrest Country Club. To make matters worse for Hadley, he had to wait for four groups to finish their rounds before he knew he had nailed down the win and the $180,000 check that came with the victory. It was Hadley’s fourth victory on the Web.com Tour. Jonathan Randolph, playing in the final pairing, stood on the 17th tee knowing he needed to make up two shots to force a playoff. He finished par-birdie, and Hadley finally allowed himself to soak in the win. But the playoff didn’t come to fruition, and Hadley is heading back to the PGA Tour next season. He leads the Web.com Tour Finals money list with $207,000 after two of the four events in the Finals. The lanky Georgia Tech graduate lost his PGA Tour card in 2016, and has now played his way back on to golf’s biggest stage. It will also be a big year for Tyler Duncan. The 28-year-old Purdue graduate led after the second and third rounds, but he was one of the players Hadley passed on his way to victory. But Duncan, like Hadley, was smiling at the end of the day. That’s because he had bumped up his earnings in the Finals to $43,157, more than enough to ensure a PGA Tour card of his own next season. It will be a whole new world for Duncan, who finished in a tie for fifth at 12-under. And he’s going to be experiencing another great feeling in the near future: He’s getting married soon. “I’m just looking forward to the wedding (on Oct. 21) and the PGA Tour,” Duncan said. As for Randolph, all he could do at the end of the day was tip his hat to Hadley. “I did everything I could do, and kudos to him,” said Randolph, who has played 52 PGA Tour events and earned his way back on the Tour as he finished one stroke behind Hadley (and netted an $88,000 check). Meridian resident and former Boise State golfer Troy Merritt shot a final-round 68 to finish in a tie for ninth at 11-under. Merritt has earned $22,375 in the first two events of the Web.com Tour Finals. The Albertsons Boise Open presented by Kraft & Nabisco returns to Hillcrest Country Club September 14-17. The event will be the second of four Web.com Tour Finals events where players compete for one of the 25 PGA TOUR cards available. Boise, ID (August 7, 2017)—Albertsons Boise Open presented by Kraft & Nabisco Media Day hosted by Coca-Cola was held today at Hillcrest Country Club. The 2017 edition marks the 28th consecutive year the tournament will be held in Boise making it one of the longest standing tournaments on the Web.com Tour with the highest purse on Tour of $1 MILLION. The event included tournament updates in addition to a press conference featuring special guest Alex Prugh. Prugh hails from Spokane, Washington and attended the University of Washington where he played four years on the Men’s Golf Team and was twice named to the All-Pac-10 team. Prugh was in the field last year in Boise where he carded rounds of 68-67-66-72 and finished in a tie for 24th. Looking ahead to this year’s tournament Prugh stated “Boise is a special place in September and I especially enjoy the Pacific Northwest in the fall.” When asked about the golf tournament Prugh said, “This has become a favorite amongst the guys on Tour. We circle this one at the beginning of the season.” Prugh currently ranks [ ] on the season-long money list and will look to continue his fine form heading into Boise. As a Finals event this year’s field will once again include the top 75 players on the Web.com Tour Money List and those players ranked 126-200 in the PGA TOUR FedExCup standings. Last year’s Albertsons Boise Open was won by Michael Thomspon who closed with consecutive rounds of 64 over the weekend. Finishing T-4 was fan favorite Andrew “Beef” Johnston who elected to play the Web.com Tour Finals in an effort to secure his PGA TOUR status for the upcoming season. Johnston did so on the strength of his solid finish in Boise. Other notables in the field included Mackenzie Hughes, Xander Schauffele and 2016 Player of the Year Wesley Bryan each of whom have won during their PGA TOUR rookie seasons. “As a finals event we’re able to bring one of the strongest fields of the season to Boise” said Albertsons CEO Bob Miller. 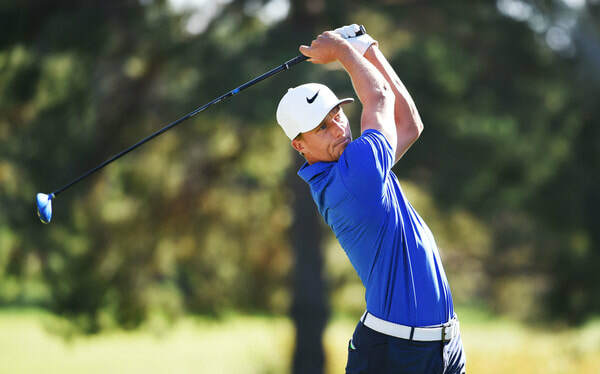 “With established PGA TOUR champions and the game’s future stars, this year’s tournament promises to be as exciting as ever.” Many of golf’s biggest names have played in Boise over the years including Bubba Watson (2005), Jason Day (2006), Justin Thomas (2014) and Rickie Fowler (2009) who made his professional debut at Hillcrest. Albertsons Boise Open Executive Director Jeff Sanders announced the Blue Cross of Idaho Birdies for the Boise Brave set to debut in 2017. Blue Cross of Idaho has pledged $40 for each birdie made throughout the week. “The Albertsons Boise Open presented by Kraft & Nabisco has always been a charity driven event and we are excited to continue that tradition in 2017” said Executive Director Jeff Sanders. “We have been able to help some remarkable organizations throughout our 28 years here and we’re thrilled to have Blue Cross of Idaho on board to thank the men and women who protect us each day.” The Patriots Outpost will be open during play Thursday through Sunday and features catered lunch courtesy of Albertsons. Admission is free to all past and present Military members, Police and Fire Fighters and their families. Tournament week will begin Monday September 11th with the Blue Cross of Idaho 9/11 Memorial Ceremony at 12:00 PM around the tenth tee. The tournament will also host the Idaho Statesman Junior Clinic presented by Tyson Foods on Wednesday September 13th beginning at 5:00 PM. Admission and parking are free and the clinic will be held on the driving range at Hillcrest Country Club. Litehouse Foods Family Day will be held on Saturday from 11:00 AM – 3:00 PM at the Pepsi Pavilion with complimentary games, face painting and more! Litehouse Foods, an Idaho based family owned company will be providing free samples of their fresh and delicious offerings to all specatators. Children under 17 are admitted free with a ticketed adult throughout the week. The Pepsi Pavilion and Albertsons tent will be open for the duration of the tournament Thursday through Sunday featuring free samples, and a variety of dining options. Sunday features Breakfast at Hillcrest presented by Yoplait and Nature Valley. Breakfast begins at 9:00 AM and is complimentary to all ticket holders. 2016 was a landmark year for the tournament off the course as well. The event raised $1.4 MILLION for charity, marking the tenth consecutive year the tournament raised more than $1 MILLION. “This event has become a fixture in the Boise community over the years” said Sanders. “Giving back to the community that surrounds us is of the utmost importance.” With the $1.4 MILLION raised last year the Albertsons Boise Open has now raised $20 MILLION for the Treasure Valley community since the inaugural event in 1990. A large portion of these charitable funds are raised through the Tyson Foods TICKETS Fore CHARITIES program which directs 100% of tournament ticket sales to charity. For more information visit AlbertsonsBoiseOpen.com. 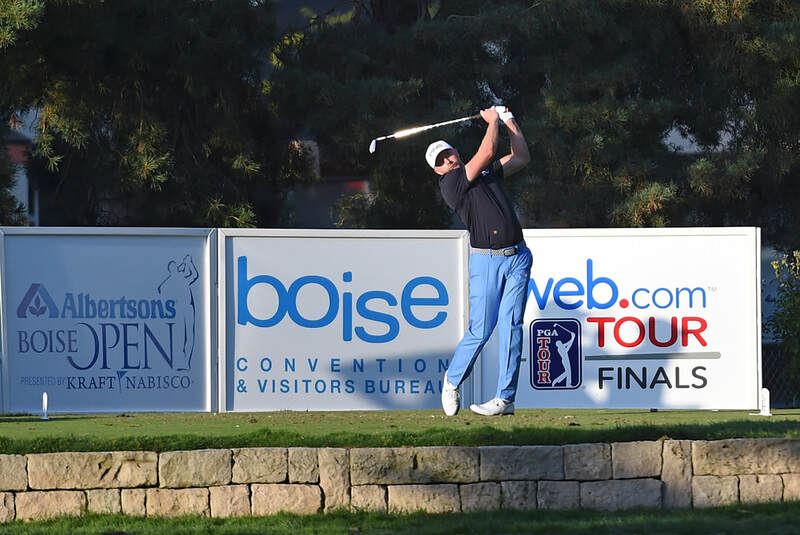 Media and Fans can follow the Albertsons Boise Open on Facebook, Twitter and Instagram. The Albertsons Boise Open presented by Kraft & Nabisco announces the Blue Cross of Idaho Birdies for the Boise Brave Program set to benefit local Police, Fire and Military charities. Boise, ID (August 7, 2017)—Today at the Albertsons Boise Open presented by Kraft & Nabisco Media Day hosted by Coca-Cola tournament officials announced the launch of the Blue Cross of Idaho Birdies for the Boise Brave program. This new campaign raises charitable funds by collecting per-birdie pledges from corporations and individuals in the area. The Title Sponsor, Blue Cross of Idaho has committed $40 per birdie throughout the week. Last year saw 1,610 birdies made by PGA TOUR professionals and with this initiative, funds raised will go towards local police, fire and military charities. The tournament has set a goal of $100 per birdie for the inaugural campaign. Benefiting charities of the Blue Cross of Idaho Birdies for the Boise Brave include the Boise Firefighters Local 149 Burnout Fund, Boise Rescue Mission, Mission 43, Veteran Golfers Association and Boise Police Activities League. “We feel strongly that it is important to honor those who protect and serve our community” said Tournament Executive Director Jeff Sanders. “We are excited to launch the Blue Cross of Idaho Birdies for the Boise Brave program this year and raise money for those who sacrifice so much for our safety.” The Boise community is invited to join Blue Cross of Idaho and Albertsons in raising money for Boise’s brave and can do so by visiting AlbertsonsBoiseOpen.com. New leaderboards will be featured on the 17th and 18th holes this year at Hillcrest Country Club and will provide updates on money raised by the Blue Cross of Idaho Birdies for the Boise Brave program throughout the week. The 17th green will feature an American Flag, tended by military personnel. New this year the Patriots Outpost will be located on the 17th green and will feature complimentary lunch along with some of the best views on the course. This venue is open to all active Police, Fire and Military members free of admission. The 28th Albertsons Boise Open presented by Kraft & Nabisco will open on Monday, September 11th with the Blue Cross of Idaho 9/11 Memorial Ceremony. Set to include a performance of “America the Beautiful,” and the Military Honor Guard raising the American Flag. This special ceremony will provide a patriotic start to the week and mark the kick-off of the inaugural Blue Cross of Idaho Birdies for the Boise Brave program. The ceremony will begin at 12:00 PM and is being held around the scenic tenth tee at Hillcrest Country Club.